I'm in complete favour of quick easy food that can be thrown together in moments and are super nutritious and delicious. 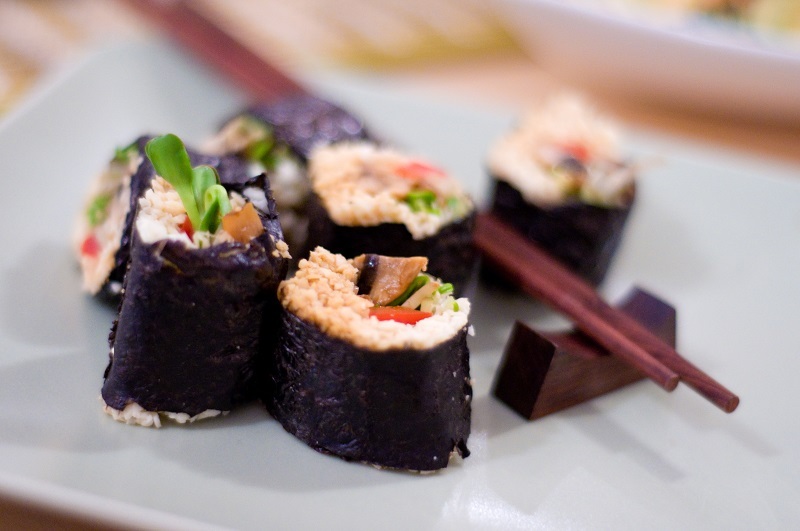 Nori wraps are are are great way to get the benefits of seaweed into our diet and are a perfect filling meal. There are a couple of essentials I always try to have to hand - tahini (preferably raw if you can get it), miso, lemons, home-made sauerkraut and nori sheets. Tasty extras are Sea Clear and Umeboshi. Seaclear is a fermented mix of chlorella, kelp & miso. Umeboshi is a pickled fermented plum that is lovely and sour. Only a tiny amount of either is needed as they are so dense in flavour. If you don't fancy making a raw pate or have the time to whip up a sauce or cauliflower rice, simply mash up an avocado or spread a thin layer of hummus onto your wrap (cooked or raw hummus). Add superfoods (optional) - if you have shaman shack 'Sea Clear' (fermented chlorella, kelp & miso paste), add 1/2 tsp. If not, then experiment with your favourite superfood - eg 1/2 tsp maca, kelp or foti root all work well. once nice and smooth, spread onto wrap then fill wrap with whatever takes your fancy.